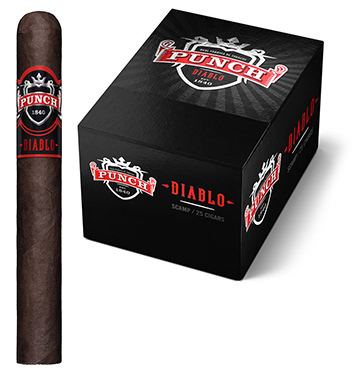 If you guessed by the name that Punch's Diablo premium cigars are the brand's fullest and darkest Punch yet, you'd be correct! Blended and hand rolled in A.J. Fernandez's Esteli factory, Diablo is made with 4-year-aged Nicaraguan and Honduran Habano Ligero tobaccos bound in Connecticut Broadleaf aged 6 years. Finished with a dangerously dark, meticulously fermented Ecuadoran Sumatra Oscuro wrapper leaf, Punch Diablo cigars are medium/full-bodied, spicy, rich and full of flavor. A devilishly good smoke if we do say so ourselves.